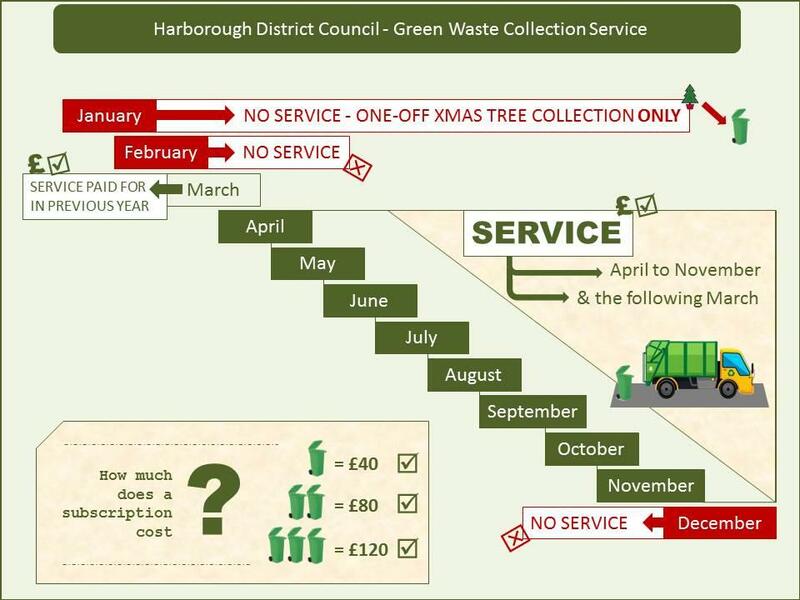 Residents in the Harborough District can subscribe to the garden waste collection service to have their garden waste collected for an annual £40 subscription fee per bin. By signing up to the service using one of the links below you are requesting the collection service only. If you also require a new green bin then please order one by completing the Bin Request Form. 1. The garden waste collection service is provided for nine months of the financial year; with collections from April to November and the following March of that financial year. For more information, click here to view an infographic. 2. When a direct debit is set up, there is a ten working day 'grace period' to allow customers to cancel the direct debit, if necessary. If this period includes the first day of a month, then the initial payment will be taken on the first day of the following month. For example, if a garden waste direct debit is set up on 28th March, the initial payment will not be made on 1st April - it will be made on 1st May. 3. Some customers have reported receiving a pair of entries in their direct debit records, which has caused some confusion. Our payment management provider creates two entries for direct debits, which appear in bank account direct debit records in the format MAN-123456-654321 and SUB-123456-654321. This does not mean that your direct debit amount will be taken twice. It is the payment management provider’s method of recording parts of the direct debit transaction. Please do not cancel either direct debit instruction. Read the full garden waste service terms and conditions [.PDF]. Your information will be used so that we can provide you with a Green Garden Waste Collection service to you through our Contractor. Under Article 6(1) (e) of the General Data Protection Regulations, we are permitted to use data for our tasks; data Protection law describes this legal basis for handling your information. It will be used by Harborough District Council and our partners to deliver and improve services, provide updates on any service changes, subscription reminders, any changes in payment methods and fulfil our statutory duties. We will not disclose any personal information to any other third parties unless this is required to provide the service or allowed to do so by law.